You may have noticed our latest billboards. Actually, you can’t really miss them. But I’ve attached a photo of one just in case. 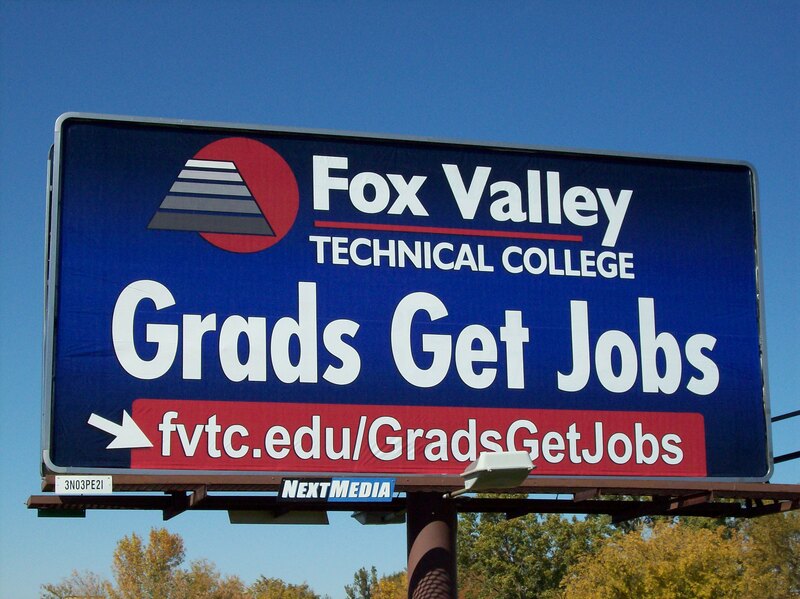 The billboards really speak to the heart of Fox Valley Technical College’s mission which is, in a nutshell, “education for employment”. Our work, day in and day out, is to prepare people–no matter what their situation is, their age, their background, their experience–for the workforce of this region or beyond. And what we provide is career and technical education…preparation for the overwhelming majority of jobs available in our workplaces. The billboards promote the fact that our grads get jobs which is very reflective of our graduate placement results, even in this extremely tough economy. In the years before this recession, about 92% of our graduates were employed within 6 months of graduation. As bad as this job market has been, I was very concerned that this placement rate would drop substantially. To my amazement, that hasn’t happened. Our 2009 graduates (as a whole) experienced an 85% placement rate within 6 months. We have a follow-up study underway right now on how our 2010 grads fared in the job market. Recently The Post-Crescent’s “Best of the Valley” winners were announced in a variety of categories. These results are based on the votes cast by members o f the community. It was very nice to see that for the fourth consecutive year, Fox Valley Technical College took the top honor in the continuing education category. You may or may not know that last year FVTC served over 47,000 people, most of whom participated in what is called “continuing education.” For us, continuing education involves a wide range of programming and individuals who participate for a wide range of reasons. Over 20,000 people alone participated in training sponsored by their employers and customized by the College to address their needs. Many individuals attend seminars and workshops conducted by the College. Then there are simply a wide array of credit and non-credit classes offered by Fox Valley Technical College in the communities of the region–classes for personal enrichment, classes to renew certifications, classes to learn a new and specific skill, classes to learn a new language. I could go on and on. On the afternoon of October 4th, I boarded a Lamers bus with about 60 educators, students, and community members bound for St. Peter, MN. St. Peter is home to Gustavus Adolphus College and for each the last 46 years, the College has hosted Nobel Prize winners and top scholars from around the world for two day symposia on a variety of topics. It is billed as the “only place where academics and instructors are treated like rock stars!” I must admit, that while this year’s topic was interesting (Making Food Good), I was not convinced that the travel necessary to get to St. Peter (a six hour bus trip) was going to be worth the effort. I could not have been more pleasantly surprised! I think that it is good for us to periodically sit down in a room with people smarter than ourselves and see if we can keep up. It stretches our minds, makes us think differently about issues, and challenges our assumptions about how the world works. Think that I am talking about the Nobel Laureates that we heard speak? – Think again. The smart people I am talking about are Scott Finley (culinary instructor), Daniel Maaske and Karli Valenta, two culinary students who came along. I’m talking about Randy Tenpas (agriculture instructor), Stephanie Jentz and Keisy Cabrera – our agriculture students. We may not have Nobel Laureates on our faculty, but I can tell you that the voices representing FVTC were some of the most well respected, most informed, and most articulate voices at the conference. While we may feel like we are the “best kept secret” and that other institutions, faculty, and students sometimes get more respect, I can tell you that these six individuals opened many eyes over the course of the two days.